The NAMM Show was absolutely amazing! We spent 4 days visiting a ton of manufacturers, meeting you guys, and planning out some amazing stuff for 2019! God bless all of you who voted for us, we won a TEC Award! – it’s unbelievable! 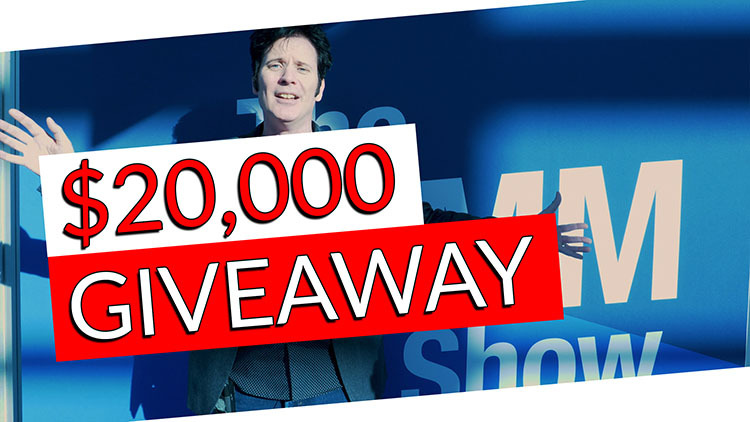 As a wonderful reward for being so amazing we are doing a $20,000+ giveaway from tons of manufactures who have very kindly given us products to give away, plus we’re going to throw in a whole bunch of our courses, memberships and all kinds of wonderful things! 1. Enter the giveaway by completing one (or all) of the entry options above. The more you enter, the better your odds of winning! 2. In about 2 weeks we will randomly draw 35 names to win one of the items listed below. 3. We will contact all the winners via email, so please provide us with an email address that you check often! Below you can find all the amazing companies who have given us products for this massive giveaway so check them out! These two cardioid condenser microphones feature top-of-the-line studio technology. The LCT 240 PRO is a tight, bold, and mid-forward mic with an open top end, while the 1” capsule found in the LCT 440 PURE takes the sound of LEWITT’s high-end microphones and boils it down to its essence, resulting in a beautifully balanced, brilliantly clear performance. Take control of your music with the T8S ToneMatch mixer, the T8S is a compact eight channel interface designed for performers. Engineered with a powerful DSP engine and intuitive user control, the T8S offers studio quality EQ, dynamics and effects. Sound great with integrated Bose ToneMatch processing and zEQ, especially when connected to a Bose L1 or F1 system for full end to end tonal control. Play confidently on stage with the rugged T8S using its tactile controls, easy to read LED display and scene recall. The T4S and T8S: true performer’s companions. The Sontronics SOLO is a handheld dynamic supercardioid microphone that is the world’s first dynamic mic to be designed, developed and made in the UK. The non-technical answer to this question is that an IR is a snapshot of a speaker cabinet’s linear characteristics. For speaker cabs, this means frequency, edge response, and phase response. In even simpler terms, an IR you download from our website is a speaker cabinet emulation that is inserted in your signal chain after your amp simulator. Pro Mix Academy is a collective of professional producers and engineers who share their knowledge and experience to help you develop the skills you need to take your music to the next level. Reference 4 and pre-calibrated Sennheiser HD 650 headphones bring you sonic accuracy, unattainable by hardware alone. Uniquely advanced filter engine allows Sonarworks to correct all FR dips and peaks, making these headphones perfect for monitoring, on-site duties as well as record mastering. Each of these use scenarios have a corresponding filter setting. Minimum phase when no latency is paramount, linear phase for extreme accuracy and a golden middle setting – mixed phase. Thanks to the software nature of this product, you will be able to get the same high sound quality no matter you are – get your studio sound whilst being on tour. Every headphone, if used with Sonarworks calibration will have the same neutral tonality, so over the distance collaboration is made much consistent – no more guessing what your partner hears. iD14 delivers the audio performance of a large format console in a compact and elegant desktop package. iD14 provides two Audient console mic pres, class-leading Burr Brown converter technology, console style monitor control, JFET D.I and our virtual scroll wheel technology, ScrollControl. With its versatile feature set and intuitive layout, iD14 will become the hub of your studio in no time. RX 7 Standard introduces new features and workflows that allow you to easily edit, repair, and restore audio to pristine condition both in post and music production. Effortlessly fix clicks, pops, hum, noise with Repair Assistant, rebalance music or isolate vocals with Music Rebalance, and surgically fix dialogue intonation and musical performances with the new Variable Time & Pitch modules. The Gold Digger™ is a 4-input, 1-output switcher that allows you to seamlessly audition multiple microphones through a single preamp, improving studio efficiency and workflow without altering the tone of each microphone or requiring down time to re-patch any cables. Let us know what you’re most excited about and don’t forget to enter this MASSIVE giveaway above! !